The following are reprints of posts I made to the RV-List concerning the excellent EZ-Pilot autopilot in N399SB. Some of this info is historical in that it reports on features in the early version of the device. Features have been added and enhanced since some of these messages were originally posted. 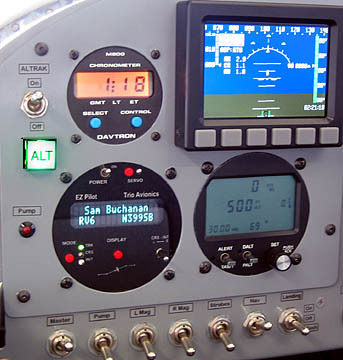 This photo shows the VFD display version of the EZ-Pilot. I am now flying the LCD version which is preferred for aircraft with large canopies such as the RV's. From the very early planning stages of the panel in my then VFR RV-6, I considered the wing-leveler to be not only a convenience, but the way out of an unexpected bad situation. The Navaid has faithfully served my needs for over 500 hrs, and I have learned most of its little quirks. But.....there is a new kid on the block. Even though the DigiTrak guys have gotten a lot of deserved attention with their new systems, and I am a very satisfied AlTrak user, Trio Avionics has introduced an auto pilot for us Navaid pilots who want to join the 21st century. I have now completed a handful of hours flying the new EZ-Pilot. My trusty Navaid has been permanently benched! The EZ-Pilot uses the Navaid servo, and for Navaid users is shipped with an adapter cable that makes it plug-n-play. You can purchase just the control head if a functional Navaid servo is already installed. The feature set of the EZ-Pilot is far beyond what the Navaid can offer. I am amazed at how I can fly 180 degrees away from a waypoint, hit the servo switch on the EZ-Pilot, and watch the thing fly my RV-6 into a perfect teardrop intersection with the direct course to the waypoint. Having nav info displayed on the control head also brings real utility to flying heading vectors as well. The roll control is via a solid state gyro so there are no little motors spinning in the control head. The yaw response is quicker and more precise than the Navaid which results in a better ride in turbulence. I realize some of these features are available with the DigiTrak, but the cool thing about the EZ-Pilot is the way it can serve as an impressive upgrade for us Navaid customers. The only problem I have found with the EZ-Pilot is the VFD display. The unit was designed by guys who fly those planes with the wings on the wrong end of the fuse, and their panels are somewhat shrouded from direct sunlight. The VFD display is cool for those guys but gets blown out in the direct sunlight that we can get on our exposed RV panels. As long as the sun is not shining directly on the display, it really looks nice. But I have to shade the unit with my hand to read it when the sun is at my back. Update: The EZ-Pilot is now available with an LCD display. I am now flying this display and it works perfectly and eliminates the issues associated with the VFD display. Having said that, I have NO intention of putting the Navaid back in the plane! The preciseness and features of the EZ-Pilot are just that much more advanced than what I had been flying. Jerry Hansen, one of the trio at Trio Avionics has been very receptive to my input during beta testing and is aware of the display issue. I think you will find him a good guy to work with if you decide to pursue his system. These are exciting times for experimental aviation! The new toys just keep coming. Flying around with the Dynon doing its thing, the AlTrak holding altitude within 10-20 feet, and the EZ-Pilot holding course within 0.01 mile, and me just sitting there watching over everything and for traffic.......its hard for me to believe this affordable yet sophisticated capability is in a plane that was hatched in my backyard. I made a flight this evening for the purpose of flying the EZ-Pilot without GPS to see how it would react to loss of reference data. After getting the plane established on heading and altitude in light turbulence with the EZ-Pilot engaged, I turned off the Lowrance Airmap 100 and watched as the EZ-Pilot display indicated "No GPS". For two minutes the flight continued as before except for a drift of about five degrees in heading. I could not feel a difference in the way the auto-pilot, now wing leveler, kept the wings level, even in the light chop. I then rolled the plane 45 degrees left followed by a 45 degree roll to the right. While the plane was in the right bank I released the stick and the plane rolled back left, then a few degrees left of center, then back to wings level. Next was a 180 degree standard rate turn to the right. As I neared the end of the maneuver, I released the stick with the plane still banked to the right; the plane rolled a few degrees past center then settled back into wings level. This is getting interesting! Next came a 45 degree bank to the left for 90 degrees of yaw followed by a similar turn back to the right. While the plane was in the 45 degree right bank, I released the stick, the plane recovered, but the brutality was beginning to take its toll on the solid-state gyro. This time the wings stayed tilted about five degrees to the left and the plane began a very slow, one degree/sec yaw to the left. I banked the plane a few more times and the gyro finally began to get a little "drunk"; it would no longer return absolutely to wings level and the plane was now doing very shallow turns instead of flying straight. I could have used the trim switch to straighten out the flight path if desired, but that was not the point of this test. However, at this point, the EZ-Pilot had been flying the plane for over twelve minutes and had endured many abrupt maneuvers; even though the system could no longer fly the plane straight without retrimming, it still had no difficulty keeping the plane upright. Maximum "lean" angles I saw even with the gyro saturated was less than ten degrees. It could be that if the test had continued for an extended period of time with more maneuvers, the system would have finally lost its sense of balance. But I was very impressed at how long the EZ-Pilot can keep the plane upright even though it has no reference to gravity or heading. If a momentary glitch occurred in the EZ-Pilot GPS data stream, the pilot would never even notice it. And if GPS goes down for an extended period of time, the EZ-Pilot gyro will give the pilot plenty of time to get his hands out of his pockets, and the thermos jug back in the cupholder, so he can reset the trim and continue the flight, all without causing any alarm or stress. I continue to be impressed at the solidity of this system. Update: Since this post the EZ-Pilot has undergone hardware and software upgrades to further enhance its ability to hold a heading without GPS guidance. set gives this puppy some tricks that are not available in any other wing leveler, and probably not any other autopilot regardless of complexity. with the EX-Pilot made this upgrade a no-brainer. Since the system is digital, it offers great flexibility in the way you can program it for your needs. The way the unit intercepts courses and rolls into turns can be customized to your taste and aircraft. We just had another EZ-Pilot installed in one of the RVs at DCU and when I checked on the pilot yesterday, he was all grins after returning from a cross country lunch flight. This is a very capable system backed up by a company that appears to be committed to the long haul and I think we are going to see a bunch of EZ-Pilots in RVs in the months to come.